You may find this hard to believe, but I wrote about “What We Can Learn From Justin Bieber” at the American Express Open Forum. Just posted an article about how to persuade people at the American Express Open Forum. Click here to read it. Amber MacArthur provided a list of the five social-media tools that small business should begin with. They aren’t the latest—but you might not want to be at the cutting edge at all times. Read her posting to learn how to get going. Over at the American Express Open Forum, I’ve posted an article called “The Lesson of Satzuma.” This is explains how a tiny company called Satzuma stood out of the CES crowd by focusing on a fun group of products. Check it out as a marketing lesson. Learn more about marketing. Dan Zarrella, social-media maven, explains how and when to use social media site such as Facebook and Twitter. He is the author of The Social Media Marketing Book. Read the post if you’re wondering how to optimize your social-marketing efforts. For technology companies, a product demonstration is the purest form of sales because you really have to wow your audience with your product. Here is a list of 5 things to avoid if you want to not make a Stunningly Awful Demo (SAD). A few weeks ago Garage ran a conference called Revenue Bootcamp. One of the panel featured a group of experts discussing whether advertising was dead for a website revenue model. These experts represent Facebook, Yahoo, Glam, Federated Media, and Microsoft. Click here if you’re interested in using the advertising model. Check out the design of my new business card here. 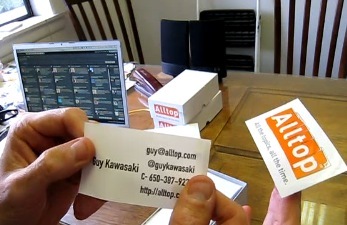 It’s a combination of my company’s logo and a business card—truly making a business card a marketing device. If you have a cool logo, you should do this too! Will Anyone Pay for Anything? Over at the American Express Open Forum I posted an article about a panel of young people discussing how they use the Internet, what they pay for, what they would pay for, and what they won’t pay for. Fascinating stuff if you’re trying to make a web business work. Click here to read it. I came across a good guide to social marketing that you might find interesting. It’s called “Social Marketing Playbook,” and the folks at 360i wrote it. You can read and download it here. Dave Balter, the founder of BzzAgent, provided me with ten tips for building a brand community. Check out his tips here if you're trying to build an online community for your company. Please mark it “found useful” if you did. More about social media at Socialmedia.alltop.